HOA Stories Archives - Page 3 of 26 - Neighbors at War! 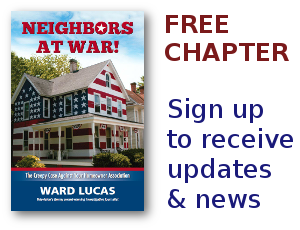 In my book, Neighbors At War, I wrote about a nasty little piece of HOA theft called ‘transfer fees. ‘ They’re hidden deep within the text of your CC&Rs and the vast majority of home buyers never even see them. Sometimes they’re not even in the paperwork. But they can cost you hundreds to thousands of dollars at closing time. What are transfer fees? They’re a scam. They probably refer to photocopying costs which at ten cents a page shouldn’t cost you more than about ten bucks. But the transfer fee is pure slush that pours into the pockets of the nearest property manager or lawyer. Disaster Relief for HOA Members? Ha! 1 Comment on Disaster Relief for HOA Members? Ha! I’m linking to the CAI site only for the purpose of backing up a previous blog. If you are living in a Homeowners Association which experiences a weather or earthquake disaster, don’t count on getting federal help of any kind. An HOA member hit by a flood is not considered a homeowner, but an investor in a corporation. When 20,000 homes were damaged in the Boulder flood two years ago, many homeowners discovered they were flat out of luck. Those inside HOAs found that FEMA wouldn’t help them and they couldn’t get federal loans. They couldn’t buy federal flood insurance either because they didn’t live inside recognized flood zones. Who knew Boulder Creek could ever launch that big a flood? This One Will Absolutely Fry Your Brain! 1 Comment on This One Will Absolutely Fry Your Brain! Here’s an HOA in Central Florida that will fine you ten thousand bucks if you post a negative online review about the community. And that money has to be paid within ten days. Not only that, but this fascist HOA leader claims to own all copyrights of all material posted by his Windemere Cay Homeowners Association. From what store are these idiots buying their supplies of Stupid Juice? One the the greatest things about this Neighbors At War website is it brings people together in a very unusual way. Most women meet for coffee, a museum tour, book club, or quilting retreat to enhance their social lives. Men meet for a beer, golf outing, or a fishing trip to Alaska. But regardless of our “outside” interests we all “meet” every day or a few times per week on this website. Are we just compelled to read about the sickness that prevails in America’s HOAs? Or are we hoping for an outside chance of some humor to be found here? Finally, An Organization I Can Believe In! 12 Comments on Finally, An Organization I Can Believe In! I’ve never been a big fan of the ACLU. Oh, I’ve interviewed ACLU officials a number of times in my career. They’re rarely the ones who say, “No comment!” And some of their battles I’ve certainly supported. Sadly, there are too many cases which I firmly believe that the ACLU won’t touch. It’s a completely different story where the Institute for Justice (IJ.org) is concerned. They, too, are a civil rights organization but they seem to be more focused on housing, minority rights, and seeking out the kinds of justice that would help all of us, not just small minority interests.